Congratulations to our Andover project team! Works on the new David Lloyd Club in Emerson’s Green, Bristol have now started! Congratulations to our Andover team on winning a CCS national site award! 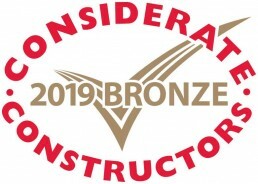 The Considerate Constructors Scheme Award is based on Appearance, Community, Environment, Safety and Workforce. Thank you team for your hard work in achieving excellent and exceptional scores in all these areas: this resulted in receiving this bronze award. Well done!